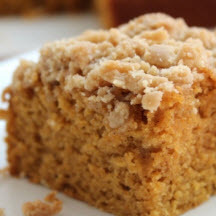 Santa will forego the cookies for a big chunk of this scrumptious pumpkin crumb cake...and of course, a tall glass of cold milk to wash it all down. In a large bowl, combine all ingredients and blend on low speed until completely moistened, about 1 minute. Beat at medium speed for 2 minutes. Spread batter in greased 13x9x2-inch pan. In a medium bowl, combine topping ingredients with a fork. Mixture will be crumbly. Sprinkle evenly over batter. Bake 40 to 45 minutes or until center springs back when lightly touched.